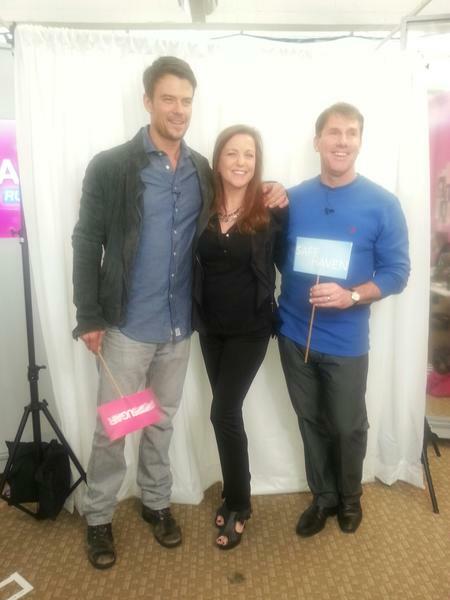 Last week I had the fun and fabulous opportunity to accompany Author and Producer Nicholas Sparks and Co-Star Josh Duhamel of the movie “Safe Haven” as they toured some local SF Bay Area tech companies. I’m a fan of Josh Duhamel movies, where he delivers great performances as a romantic lead actor, and I also look forward to movies made from Nicholas Spark’s romantic books. While comedies and action thrillers have their place, I can’t resist a good romantic movie in a beautiful setting where the main characters sizzle, experiencing romance and transformation through a suspenseful storyline. A private screening of “Safe Haven” that day helped me realize that the movie delivers on all of that (and more!!). Here is information about the movie Safe Haven from Nicholas Sparks website: “When a mysterious young woman arrives in a small North Carolina town, her reluctance to join the tight knit community raises questions about her past. Slowly, she begins putting down roots, and gains the courage to start a relationship with Alex, a widowed store owner with two young children. But dark secrets intrude on her new life with such terror that she is forced to rediscover the meaning of sacrifice and rely on the power of love in this deeply moving romantic thriller.” The movie is inspired by Nicholas Spark’s book of the same name “Safe Haven”. Both Josh Duhamel and Julianne Hough brought their characters alive with that special chemistry that makes you root for them being together. Josh’s and Nicholas’ onscreen work is very entertaining. Would they be as engaging offscreen in real life interaction with their fans? To my delight, they delivered – and much more. Social media professionals appreciate the importance of engaging with the online community. I am thrilled every time I meet someone in real life who follows my online tech parenting columns and social media updates. From what I witnessed, Nicholas Sparks and Josh Duhamel were authentically excited to meet with fans throughout the day and greeted each and every one with the same enthusiasm, even though the line at some locations to take pictures with them was very long (such as the stop at Popsugar). They laughed, talked and made everyone feel at ease, even the gal at one of the tour stops who cried (of joy) when she saw Josh Duhamel. They even made one specific Techmama (trying to keep her cool) very happy by posing with her for some fun pictures. Josh Duhamel shared that he enjoys social media interaction with his fans via Twitter, Facebook and more. These communication methods are important to interact with his online community as well as share information about charity events such as the Youth Run with the Red Cross. Nicholas Sparks revealed that he values the importance of digital to reach fans and followers, utilizing multiple platforms such as his website, Facebook page and Twitter @SparksNicholas. He believes that interacting on digital platforms fosters quality listening, and helps him gather feedback from fans. He created the Nicholas Sparks Foundation, “a nonprofit committed to inspiring and transforming students lives through education, curriculum development, and life changing international experiences, so they are prepared to embrace a life of being active learners and engaged global citizens“. Relativity Media (Safe Haven’s Studio) partnered with the Nicholas Sparks Foundation by offering fans the ability to purchase tickets to Los Angeles Safe Haven Premiere and Post Premiere Reception on February 5th. The tickets will support the Nicholas Sparks Foundation. There are also multiple social media channels to follow details about the movie including the Safe Haven Facebook page, @SafeHavenMovie Twitter Id (and #SafeHaven hashtag) and Instagram. I saw fans sharing on the social media sites that they can’t wait for the movie to come out. Luckily, it is coming out soon – this Valentines Day (Febuary 14th). Part II of my posts about Safe Haven will include more details about tech companies visited on the Safe Haven (movie) tech tour.